TGIF everyone! First I want to thank all of my new followers for joining me. It's been a growing week! I'm excited to share my creations with everyone. Today's card is made with Raisin Boat stamps and faux washi tape. I have so many cool stamps I figured I might as well make the washi tape in the colors and designs I wanted. I will be posting a tutorial next week on creating your own tape. I cut my strips to the desired width and length added my image and done! 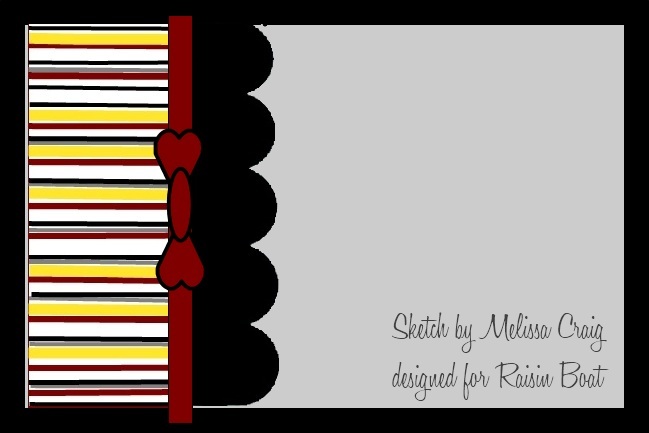 I don't make my washi tape until I know what I'm going to do and the colors I need. I put the leftover scraps in a little box and can easily incorporate them into any card! I have been on overload making these and giving classes in them. The classes are a three part series. 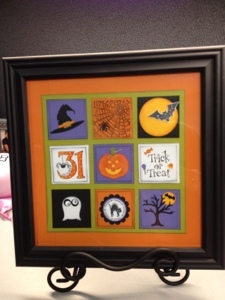 We did Halloween and will follow with Thanksgiving and Christmas! I have used punches, stamps and dies to creat each square. The coloring is done with Copics of course! I plan on putting mine in the niche as you walk in the door and change out the insert for each holiday that way I'm not dragging down one decoration to out up another! Posted by Karen at 8:47 AM 1 Click here to leave me a comment. It's another rainy Monday in not so sunny Florida thanks to hurricane Isaac! Thankfully we are not expecting a lot of activity just some rain and a little wind from the bands. I stayed in yesterday after a busy Friday and Saturday and decided to do a little "out of the box" designing. 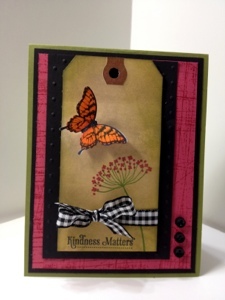 I used the Tim Holtz distressed inks to color my tag and stamped the images in the new "in colors" from Stampin Up. I colored my butterfly with my Copics (yg04 and yg68) scored the middle and attached him with a dimensional so he looks like he is flying. 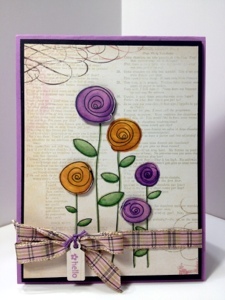 The background is stamped tone on tone using Primerose Petal. Finally three tiny buttons accent the edge. Happy Monday everyone. Our prayers are with those in the path of Isaac! Stay safe! Posted by Karen at 10:24 AM 0 Click here to leave me a comment. Posted by Karen at 9:14 AM 0 Click here to leave me a comment. TGIF! Happy Friday everyone! I can't believe we are halfway through August. How many days till Christmas? Wow! Today's are is a simple bouquet of flowers colored with my Copic Markers. My card base is a patterned paper from one of my 6x6 stacks. I stamped a couple of them in scrap paper and adhered them with dimensionals. The ribbon was a remnant I had but it matched perfectly! 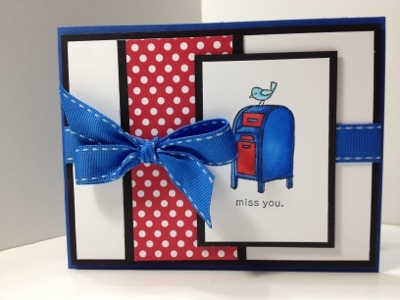 I added the little tag from my tiny tags stampin up set. Posted by Karen at 8:41 AM 0 Click here to leave me a comment. 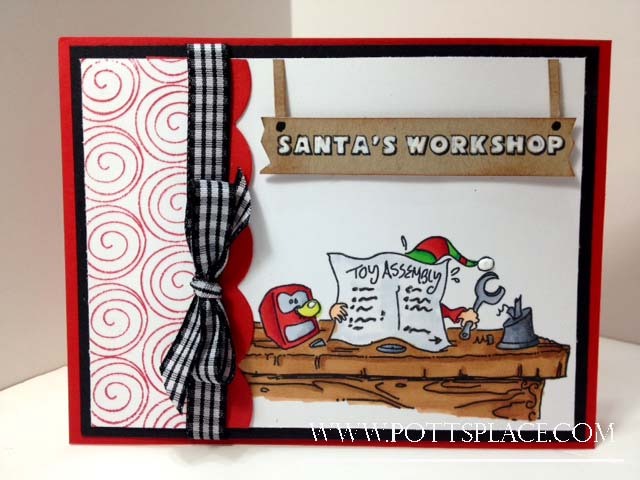 I just received the North Pole Toymakers stamp set so I incorporated the stamps into the sketch! I LOVE this image as it's great to color with my Copic markers. The ball at the end of his hat is done with liquid applique and the tools are highlighted with the Spica clear glitter pen. 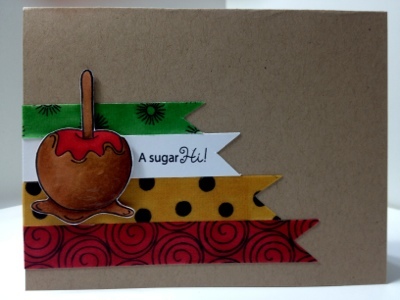 I used the lollipop stamp to create the pattened paper on the side bar. 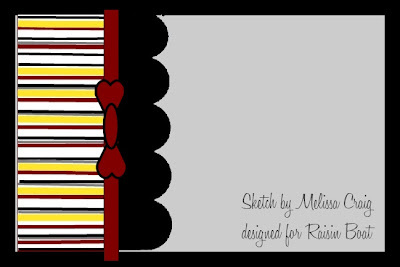 You can join along in the challenge and upload your take on the sketch at Raisin Boat. You can win your very own set! Posted by Karen at 6:32 AM 2 Click here to leave me a comment. TGIF! I am ready for the weekend! Finishing up some awesome class projects and a little R & R! 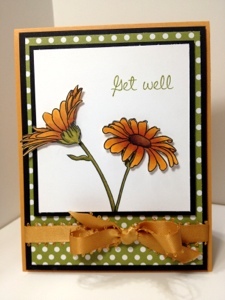 Today's card is made with the Oops a Daisy stamp set from Raisin Boat. I love the set but wanted to try something other than yellow and white so I decided to do gold for mums! I layered them on the cars base with dimensionals used some stampin up polka dot paper and added a satin bow. Posted by Karen at 8:58 AM 1 Click here to leave me a comment. Happy Friday everyone! I can finally share some of the projects I have been working on! 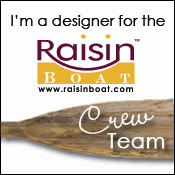 This one is made from the Raisin Boat set Perfect Partners. I jus love these little peas. I colored them with my Copics and thought they needed a cute little smile so I added them with my Copic Liner pen. 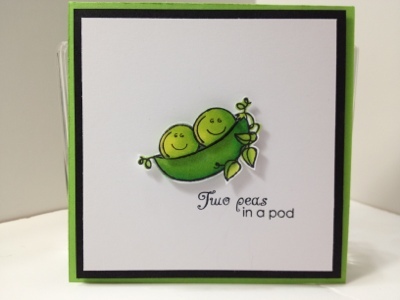 I also cut out the pod and the peas for a little dimension! Posted by Karen at 9:11 AM 0 Click here to leave me a comment. I have used this set in so many colors to create so many different flowers. Today I made it into a sunflower. It's the Raisin Boat Set Oops a Daisy! I colored the flower with my Copics and used the dot to create the pattern on the left side. The edges of the white were distressed with a brown ink pad. 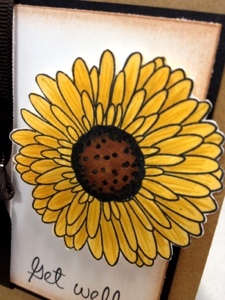 I added an extra photo of the flower so you could see the detail I added using the spica pens. Posted by Karen at 8:16 AM 0 Click here to leave me a comment. Hello everyone! It's jump day and August 1st. I can't believe in just a few weeks school will start again. The summer has flown by once again. 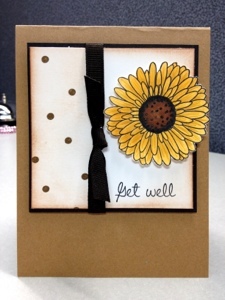 Today's card is made using the Stampin Up set For the Birds. I just love this set and it has become a standard go to for coloring with my Copic Markers. I started with a "portrait" card following a sketch and there was just too much white so I switched to landscape and really likes the look. I finished off with a coordinating bow. Posted by Karen at 9:20 AM 0 Click here to leave me a comment.